Retiring a true legend for good. Big Papi, our hometown hero. David Ortiz is a baseball legend and a Boston hero. He retired from baseball at the end of the 2016 season, and as such, we have stopped producing any Ortiz OYOs on March 31, 2017. 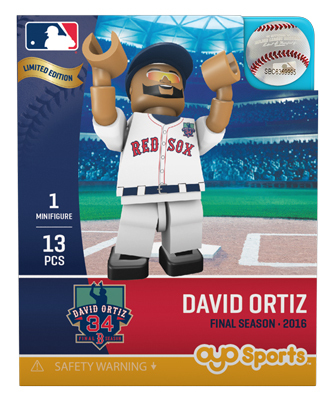 He is one of our favorite OYOs, both because we are a Boston based company, and because our minifigure faces of Big Papi seem to well-capture the joy he showed playing the game! Our New Britain Minor League minifigure is one of the hardest ones to find of him. His last All-Star Game appearance as an OYO was from Citifield and that is his lowest run available only for sale for that week.